This is a guest blog by Rob Hughes from the Angling Trust, and England carp angling team manager. Some of the more mature readers will remember the hilarious sketch from Monty Python’s famous film The Life Of Brian. Younger readers may not, but if ever there was a quote from a film that sometimes parallels the Environment Agency and its relationship with the rod licence buying public, it’s this one. The joke in the comedy sketch was that a group of people were grumbling about the Romans and what benefit they bought to the table. Eventually they decided between them that apart from sanitation, medicine, education, wine, public order, irrigation, roads, public health and the freshwater system, the Romans didn’t really bring a lot. Which is ironic really, as I sometimes hear a similar call in relation to the Environment Agency. I must confess, like many others I may dare to say, to having previously been a little ambivalent towards the EA on occasion. On the whole I sympathise with authority. It can be a bit of a no win situation at times. People expect everything but always want to point a finger of blame if things go wrong, or probably more accurately, not as right as they would like. My view of the EA is very different now to what it was some time ago. Maybe I have opened my eyes and ears a little more so I can see what is going on. Certainly I have opened my mind, and in fairness the EA are pretty effective at what they do. I’ll elaborate. A little over a year ago I embarked upon a drive to promote angling and increase participation. My role within the angling industry has always been to encourage participation within our sport in one way or another, be that through participation in events, heading off on holiday or simply through the use of fishing tackle. However, previously it had been for a company or business. This time it would effectively be working purely for the sport, through Sport England and The Angling Trust, our governing body... and that brought me into a lot more contact with authority than I had seen before. Some would have you believe that the EA simply take money off the rod buying public and don’t invest anything back into the sport but that’s just not the case. In fact it’s wildly inaccurate, and the EA do in fact pump a pot full of money back into fishing in a number of ways. Which leads us to the million dollar question… quite literally! So what exactly do The Environment Agency do for us? Well for a start there is the Angling Improvement Fund. Did you know that the EA invest a significant amount of money directly back into individual angling projects that will improve both facilities and increase participation on a local scale? 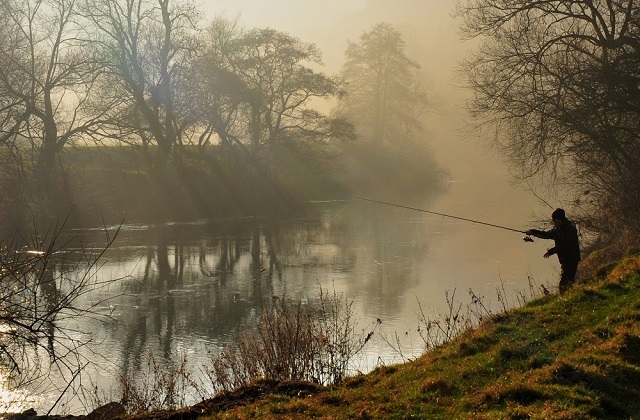 It’s administered by The Angling Trust and is available to all organisations, clubs or syndicates, open access or private, and funding can be used for all manner of reasons… from improving car parking, putting in new pegs, habitat improvement, general fishery management etc. etc. There’s also Predator Protection. A sensitive issue that seems to have been a bit of an elephant in the room in the past, but one which is being confronted. Significant amounts of funding are now being made available by the EA for fisheries to fence their waters to protect against otter predation. Additionally there is a research project going on in relation to deterrents and also consultation with interested parties to look at how the problems of predation can be addressed in the future. Fisheries management advisors are paid for by the EA to give advice on cormorant predation and how to protect fisheries from fish eating birds, and there is a lot of work going on with regards to the impact of non native invasive species such as the signal crayfish. It is not a magic wand that will solve the problem overnight, but it is certainly working in the right direction. There’s the emotive issue of Poaching and Enforcement, which most anglers see as one of the Environment Agency’s main roles. It’s a regular comment that not enough licence checks are taking place, but did you know that 39% of the funds allocated to operations are spent on enforcement? The EA is working with the Angling Trust and the Voluntary Bailiff Service to increase a visible presence on the banks and also gather intelligence that will lead to further prosecutions and reduce the amount of rural crime that affects our fisheries. Another step in the right direction. There’s the Building Bridges project, which educates and also recruits anglers from migrant backgrounds about the laws relating to fishing in the UK and what can and can’t be done. We haven’t yet touched on one of the most significant areas of EA involvement, that of Habitat Protection and Fish Welfare, the fact that the EA work closely with a number of clubs and organisations’ to provide Fisheries Advice, responding to and dealing with Pollution and Fish Health issues, the fish Breeding and Re-Stocking programme that is in place, and a whole host of other matters that, until you actually sit down and think about how important and also how complicated these matters are, you don’t necessarily think immediately of the EA. In answer to both Monty Python, and also the EA sceptic, the answer in reality is “quite a lot actually”. I disagree, the EA does nothing at all for me, it does not add anything at all to my fishing, for me, it does not improve rivers, it does not improve fisheries and it does not stock the fisheries that I go to, it only takes money for a rod license, which is just a tax, my money may be used to help other anglers on their rivers, or even in their angling clubs, but nothing where I would benefit. I live in Wales and we do not have any course fish rivers where I live, it is all run by fly fishing clubs anyway, the nearest course river fishing is about 60 miles away, I also get nothing for where I do fish because these are only private fisheries for which I buy a ticket to fish them and these fisheries do not get anything from the environment agency, whatever the owner of these fisheries does pay for, is put onto the cost of my day ticket, these are businesses and get nothing from the EA. As I said, a rod license for me is just an extra tax that I have to pay. He needs to come and fish on the river Hull. A lot of the larger fish have been eaten by a family of seals who took up residence several years ago and have since died (Probably of starvation) when reported to the EA the reply was they will go when they are ready. (Thanks for your help!) Cormorants, Herons and Otters are now moving in to take the small fish. He need not bother coming to fish from March to June (to me the best time of year for river fishing) because the EA will prosecute him unless he is fishing for flounder that is, in which case he would not need a licence. And of course if he comes in July he will still be able to fish for flounder without a licence whilst sitting next to the bloke with a licence who is fishing for Perch (Which is handy because you can swop fish)to use another famous quote "confused you will be"
Voluntary Bailiff Service is a big step forward and something I wrote a letter to the EA about 5 years ago suggesting. Whether you read the letter or not Im glad to see youve taken action. Would reccommend all anglers enrol in the VBS and help to patrol our waters from those who show no respect. This is just another tax on anglers , nothing more .I've spoken to several owners of fisheries ,and they tell me the EA does nothing for them . Why do I need a licence to fish a privately owned still water fishery ,the owners are responsible for the stocking ,upkeep and everything else that makes a fishery what it is . Why does a sea angler not require a licence ,I see plenty fishing on boats ,piers ,beaches etc and yet they don't require a licence ,because it's easier to send two guys out in a van to a fishery ,knowing anglers will be there ,then have them patrol the whole shoreline of England looking for people fishing . I believe if you fish still waters at a privately owned fishery then you should not require a licence. Why not think of the licence as a charitable annual donation especially if you fish commercials and feel they don't benefit. I am lucky to find time to go fishing once or twice a year but always renew my licence. I too usually travel to a commercial because I want to catch rather than take my chances on the Wandle or London park lakes. £27 isn't that much when compared to a round of drinks in the pub or friends round to enjoy a nice Sunday roast with your family. Anyway, many commercials are spring or river fed so don't be too sure that the EA doesn't get involved somewhere along the line. I totally agree with the above comments i do not fish rivers only privately owned waters i pay my money to fish these waters why on earth do i have to pay a Tax to hold a rod, the owner of the lake restocks & working parties do the upkeep the land surrounding the lake. The EA has no credibility. It wont be long until it is rebranded along with NE and FC with lots of useless people desperately clambering on to the Rivers Trusts bandwagon before it finally sinks. I would never have thought the ACA would be so firmly in the pockets of a group so culpable in environmental destruction through their abject neglect. I read the first batch of comments here which are all negative. Too many people criticise the agency, who are torn in all sorts of directions. If we want our rivers improved and a lot is going on, and if we want to be able to tackle intransigent landowners the cost of a licence is well worth the money.